I have been suffering from decision fatigue lately and I’ve bet you’ve suffered from it a time or two (or four or ten). What is it? It’s the inability to make more decisions because you have already made so many that you are tired and overwhelmed. Basically, it renders you unable to make wise decisions. You might even say it makes you feel more than a little brain dead. I think any mother can relate. I know that I have suffered from decision fatigue many times during the course of motherhood. But until I completed the Make Over Your Mornings course by Crystal Paine, I didn’t have a specific name for this little problem that made my brain feel like mush. A few weeks ago I had complained to my husband that I could not think of appropriate consequences for the kids. They would fight with each other, argue back to me, complain and whine, or ignore my requests completely. Then I would be frustrated but feel incapable of doing anything positive or productive to address the problems. 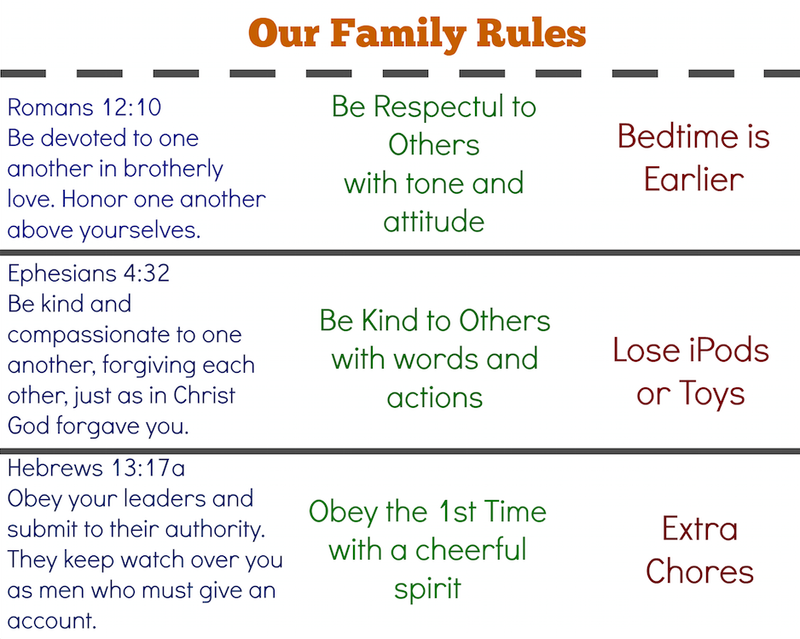 After our discussion about the discipline issues, we both agreed that we needed to return to using a chart of family rules that outlined the rule, the consequence, and an appropriate Scripture. We had created such a chart in the past but after moving to a new state, we had quit using that chart with consistency. It was time for an updated chart with new rules and different consequences. I needed something to help me consistency enforce the rules and impose logical consequences when each rule was broken. No longer could I think about a consequence in the moment, but rather, I desperately needed an intentionally prepared plan. In order to create our chart we discussed the areas in which our kids were struggling the most and tried to simplify them into basic categories. We then created a chart with 3 rules framed in the positive rather than the negative. Once the rules were in place, we found a Scripture to apply to each rule and then we determined an appropriate consequence for breaking each rule. Why did we create rules? I need to have clearly articulated rules for our home that are posted in plain sight. The rules act as a reminder and they hold everyone accountable, as well as keep me consistent in enforcing the rules. Why are there only 3? 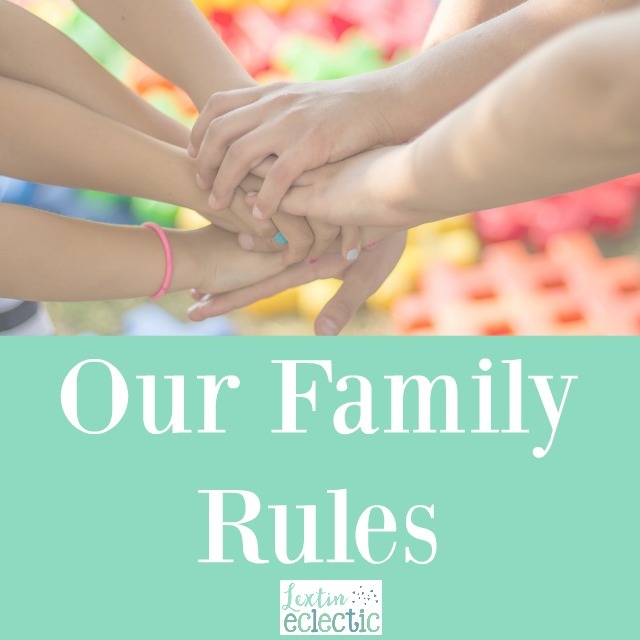 I have seen many resources of family rules that contain a fairly long list of rules. These are wonderful and very thorough, and my first instinct was to create a similar list for our family. However, after discussing with my husband, we both agreed that our list should be short. Our kids are young and we didn’t want to overwhelm them with a long list of rules that they would not be able to remember well. I was also afraid that a long list would leave me incapable of enforcing the rules because I would feel overwhelmed as well. Therefore, we feel that simplicity is the most important and that we should focus on the 3 areas that we believe are the most problematic in our family at this time. Having a short, but focused list, will allow us to change the list as needed if we feel we need a different discipline focus in a few months. Why did we use Scripture? My husband and I both feel that having a verse for each rule is very important. We want to point our kids back to the Lord as the ultimate authority and remind them that we are obeying God’s Word as parents and as a family. Each time we talk about the rules, we read the Scriptures to accompany each one. Why did we frame the rules in the positive rather than the negative? Rather than write a list of what our kids should NOT do, we wrote the rules to tell our kids what they should do instead. We want the kids to have a daily reminder of how they should act. Hopefully this desired positive behavior will become the small voice in their conscience that guides them in right actions. In this way, the rules are more like a family vision instead of a list of rules not to be broken. Why are the consequences written out? For each rule, there is a consequence listed in the event that the rule was broken. This eliminates me from having to decide on a consequence in the moment and it ensures that we stay consistent in our approach to discipline. Having the written consequence, takes the anger out of the discipline process. I can calmly point to our chart and remind the kids of each consequence. They can clearly see what is written in the chart and they are less likely to argue with me or whine about the consequence. Have you created a list of family rules or even a vision for your family? If not, I encourage you to take some time to think through the positive behaviors you would like to see displayed in your home, write them down, and post them in places throughout the house. You’ll find that everyone is held accountable for following the rules and you will no longer have to make discipline decisions in the heat of the moment when you and your child are both frustrated and angry. When creating our discipline chart, I often referred back to a couple of resources that have positively impacted our parenting. Motivate Your Child – This is my hands-down favorite parenting book. I love all the positive advice for discipline and the focus on getting to the heart of your child and not only focusing on the outward behavior. If you haven’t read this one, I highly suggest adding it to your list and reading it this year. Give Them Grace – I appreciated the focus on parenting with grace that is articulated throughout this book. With our kids it’s not about forcing obedience but focusing on Christ’s example, modeling it for our kids, and encouraging them to look to His mercy in their own lives. This is another book that has been a positive influence on my parenting decisions. Don’t Make Me Count to Three – I read this book some time ago but I loved the practical advice and the focus on ridding your parenting of angry and empty threats. The author encourages the reader to emphasize Scripture and I agreed with many of the suggestions in this book. Also, the Make Over Your Morning Course really helped me see areas in my life and in our home where I could simplify, prioritize, and be more intentional. It was a great resource to help me refresh and refocus for a new year. i love this idea Lexi! The simpler the better- and yes, we needs those in our house some days. Apparently a few children in my house need a refresher too!